Drum roll…. trumpets… buntings hung out. 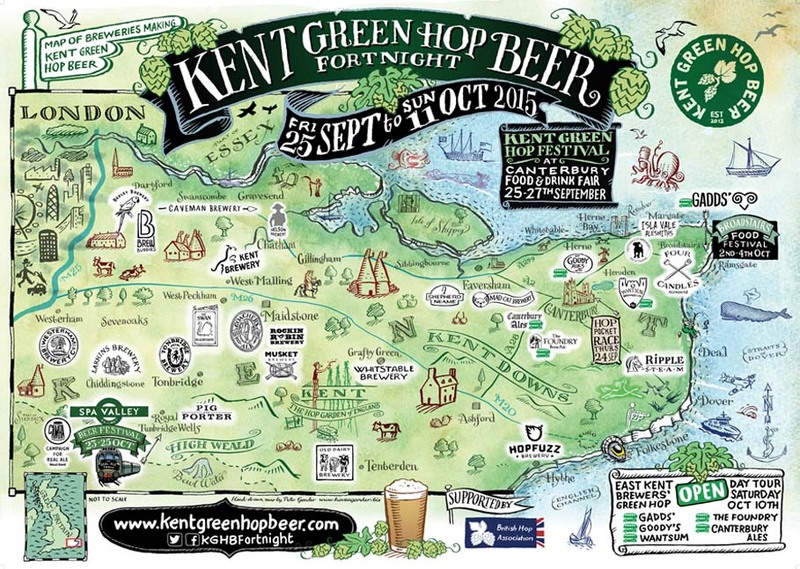 It’s the 2015 Kent Green Hop Beer Fortnight BEER LIST! NB: We do our best to make sure beer details are correct and up to date BUT they are subject to change! All beers subject to availability – please note that not all of these will be available at Canterbury Food & Drink Festival. Those unlikely to be there are marked with **. Attwell’s Green Hop (5%) Golden ale hopped either with EKG* or Northdown. Gushmere Fuggles Pale Ale (4%) Pale ale hopped with Fuggles. **Hukins Bullion Pale (4%) Pale ale hopped with Bullion. Bramling Cross Honey Ale (4.3%) Green hopped honey beer with Bramling Cross and local honey. Gold (5.5%) Golden ale hopped either with EKG or Northdown. Beer name tbc (3.8%) Pale ale hopped with Early Bird – a variety of EKG. Green and black (4.2%) Black and unfined (so may be naturally hazy), hops tbc. Simply Saison (4.5%) Saison hopped with EKG and using Belgian saison yeast adding an earthy sweetness and toffee-banana flavours. East Kent Red Rye (4.4%) Red rye beer hopped with EKG. Hefty malts provide caramel and biscuit-sweetness to balance massive herbal and marmalade hoppiness. Single Hopped Pale Ale (4.7%) Pale ale hopped with EKG. Simple, clean and crisp pale ale allowing the hops to shine. Less malt more hop! Harvest Night (5.6%) Black IPA hopped with EKG. Green Chapel Ale (4.6%) Collaboration with Canterbury Christ Church University. Hunter Gatherer (3.5%) Pale ale hopped with Bramling Cross and made with Oats for added mouthfeel. **Swanscombe Woman (4.7%) Brown ale hopped with Bullion. **Four Candles Pale Green (4.5%) Pale ale hopped with Northdown. **Four Candles Golden Green (3.8%) Golden ale hopped with tbc. Gadds’ Green Hop Ale (4.8%) Pale ale hopped with tbc. Crisp, zesty and bitter! **Gadds’ Green Hop Export (6.5%) Stronger, hoppier keg version of Gadds’ green hop favourite. (Limited Edition – available in London and the north of England and The Montefiore Arms, Ramsgate). Goacher’s Green Hop Ale (3.9%) Pale ale hopped with EKG. Green zinger (3.7%) Hopped with Bramling Cross. Green Giant (6%) IPA hopped with colossal amounts of EKG. Green Hop Best (4%) Best Bitter hopped with Goldings and Bramling Cross from the brewery’s own hop garden. Green Hop Rye PA (4%) Rye ale ale hopped with EKG. Low colour pilsner malt, combined with the dryness of rye malt are balanced against the floral lemon scents of fresh EKGs. Oatrageous Oat Pale Ale (3.9%) Pale ale hopped with Challenger. Oatmeal and Vienna malts offer a full bodied backdrop to the lemon scented essence of fresh EKGs. Flash in the Pan (4%) Golden ale hopped with Goldings and Fuggles. Green Hop (4%) Pale ale hopped with Challenger. **Purest Green (4.5%) Pale ale hopped with EKG. Strangely Brown (4.4%) Porter hopped with Fuggles. Features a marriage of roasted and flaked barley to give a traditional porter flavour. Farmhouse (4.2%) Pale ale hopped with Admiral. **Hop Rock It (4%) Old English green hop ale. Dark malts and delicate hop bouquet. Green Hop Ale (4.5%) Golden ale hopped with EKG. Capel Pale (4.5%) Pale ale hopped with Pilgrim. Light honey malts and zesty citrus hop finish. Bramling Cross (4%) Best bitter hopped with Bramling Cross. Increased hop resin projects a fruity blackcurrant overtone into this ale with a spicy yet floral background. Fuggles (4.5%) Best bitter hopped with Fuggles. Amber best bitter with hints of citrus. Brewed slightly lighter this year to delicately showcase the nature of this fine Kent hop. Bullion (4.5%) Best bitter hopped with Bullion. Spicy, blackcurrant and floral. Light in colour with reduced dark malts to showcase this exceptional hop. Challenger (4%) Best bitter hopped with Challenger. Scotney Green Hop Harvest Ale (4.5%) Bitter hopped with Goldings from Scotney Castle Hop Garden. Mid gold bitter with sweet, sappy hop bitterness balanced with malt flavours. Grafty Green Hop (4.8%) Pale ale hopped with Challenger. Expect an invigorating burst of fruity, hoppy flavour, a full-bodied mouthfeel and a floral and cedar aroma. Conqueror (4%) Hopped with Admiral. **Probably NOT available at Canterbury F&D Festival – but will be available later in the Fortnight.